This is one fabulous find for you! You can drive past this place and not pay attention - but this time, DoorCountyNavigator.com did - and we met with the owner for a tour. Read on - you will want to stay right here! Door County at its best! Right across from Fish Creek Beach. Literally! Fabulous place! DoorCountyNavigator.com approved! WOW! We toured this fabulous offering today - 3 Gorgeous 2 Bedroom units right across from the beach in Fish Creek! Spectacular water and beach views! Walk to downtown Fish Creek shopping, dining and more! This is the Fish Creek Beach House! Read on, watch the video, enjoy! And let us know when you book this place - we know you will! Right in downtown Fish Creek, just a little north of The Cookery, sits this gem of a place to stay. 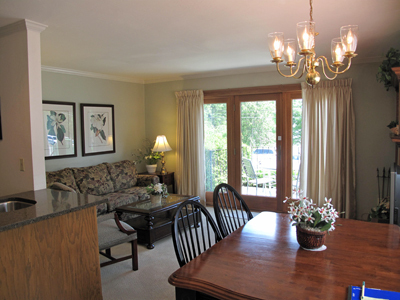 In fact, there are three units in the Beach House, and each has a spectacular view of the beach and water. You are going to love this place. We wanted to tour it so that we can bring you the scoop, so we called one of the owners, Christine, and she met with us to show us around. Chrsitine is fantasic, and so is her Beach House! 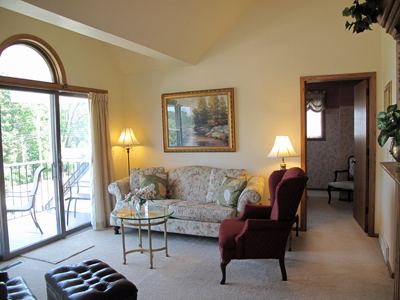 All the units have central air, are all two bedrooms, have a fully equipped kitchen, and are carpeted. And all have "the view!" Christine has a lot of experience in the hospitality business and she is an impeccable decorator - so each unit is tasteful and cozy. Eastview. The ground floor offers two units, the Eastview and the Westview. 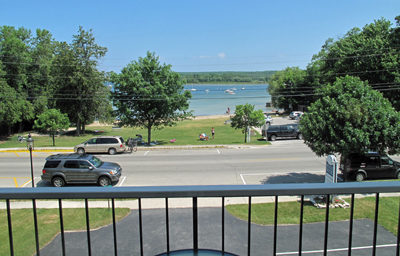 Really, the views are really all of the water and beach right across the road. In the Eastview, we found a wonderful living area, with coach, sitting chair, coffee table, flat screen TV and wood burning fireplace. Cozy and well appointed. The kitchen has a granite countertop, and is fully equipped, while the dining room offers a table with four chairs - plenty of room for the maximum four guests. The first bedroom had twin beds, with floral quilts, coordinating with the floral wall paper above the chair rail. A nightstand with tall lamp was in between the twins, and afforded a charming glow to the room. The second bedroom offered a queen with wooden posted headboard, striped wall paper, a night stand with lamp and tasteful floral art framed and handing on the walls. Separate bathroom here with whirlpool. Another bathroom with tub and shower was in the hallway. The view out of the main living room window and doorway was terrific - people were on the beach and the water looked inviting when we took a look, and small deck with a couple of chairs invited you to take in the sites and people, day or night. Westview. The Westview was the flip-flop version of the Eastview. Similar living room, with floral couch, wing=backed chair, glass coffee table, dining set with 4 chairs, kitchen fully equipped with granite countertops and more. The first bedroom had twin beds again, and large floral wall paper in muted roses. Coordinating quilts (of course! ), and a night stand with tall lamp added elegance and warmth to the room. We headed to the second bedroom, where a queen bed with curved wooden headboard and thick, white quilt graced the room. A single nightstand with lamp offered cozy lighting, while striped wallpaper added style. Again, a separate bath here. Wow! That's what we said to Christine as our crew, with cameras and video equipment, walked in. This is a wonderful unit in every way. Christine's artistic decorating touch permeates The Grandview, and the name lives up to the actual view. It is grand. Again, the living room, with floral couch, glass coffee table, leather wing-backed chair with ottoman looked so inviting. We just wanted to sit there and watch the folks playing on the beach. An oval, wooden dining table with four chairs, fully equipped kitchen, again with granite countertops, wood burning fireplace - ah - what a place! Both bedrooms in The Grandview sport queen beds. In bedroom one, the queen had a beautiful wooden and iron headboard, 2 side tables with short lamps, a large, floor swivel mirror, and striped wallpaper on top, small floral below. Beautiful room! The second bedroom had floral wallpaper on the bottom, and small patterned wallpaper atop. 1 side map and table completed the room. The view from the living room, and outdoor balcony were awesome. Take a bottle of wine out here and enjoy a nice evening "at home," with a view of the beach and bay. We loved the Beach House, and we know you will too. You'd be happy in any of the 3 units. This is a fabulous find. It is right on Highway 42, directly across from Fish Creek Beach, so there is some road noise. But, all the bedrooms in each of the three units are at the back of each unit, and so further off the road. Brilliant! Make this your Beach House, and when you do, please do us a favor and tell Christine that DoorCountyNavigator.com sent you!